The release of the Illumina HiSeq X Ten sequencing system, and its current use restriction (only human, only whole-genome sequencing) are going to cause a major paradigm shift in human genetics studies over the next few years. Until now, we’ve seen relatively few large-scale efforts to apply whole-genome sequencing (WGS) to large numbers of samples. But the capability of a single X Ten installation to sequence ~18,000 genomes per year at a relatively low cost means that, for the first time, it may become easier to apply WGS as the primary discovery tool. These are simply the reality of going from clean, defined SNP array datasets (>99.1% call rate) to next-gen sequencing data, which depends on alignment and variant calling and depth/breadth of coverage. One of the major practical considerations for whole-genome sequencing data is on the computational requirements side: data processing, storage, and retention. A binary alignment/map (BAM) file — which contains the sequences, base qualities, and alignments to a reference sequence — for a 30x whole genome is about 80-90 gigabytes in size. The BAM files for a modest sample size (1,000) might consume 80 terabytes of disk space. And that disk space is not free. It costs actual dollars to purchase and maintain over time. I’m resisting the urge to show you that cost of sequencing / Moore’s law comparison plot here. Because disk space is both finite and costly, and these files are so huge, at some point researchers will have to choose between getting new data and actually deleting some old data. Kind of like a “one in, one out” policy at a crowded bar. No one likes throwing data away. We NGS analysts shudder at the idea of not being able to go back to the BAM file to run yet another variant caller, or review that interesting variant. At some point we may have to call the sample’s analysis DONE and leave it that way. Because, let’s be honest, 99% of the bases in a BAM file match the reference. It’s the variants that we’re truly interested in. Another consideration is the simple act of moving data around. With a $10 million price tag, few research groups will be able to afford an X Ten cluster, but those who can’t will be unable to stay competitive on the cost of WGS. On the other side of the table, the lucky X Ten installation sites will need to find samples. This means that most whole-genome sequencing will take place at a few locations, and the resulting data transferred to the investigators who sent in the samples. Have you tried to download an 80 gigabyte file lately? The regular internet is just not going to work for this. You There, with the Samples! A couple of years ago, I wrote that in a world with widespread genome sequencing capacity, samples are the new commodity. That has never been more true than in the world of the X Ten. The institutions that have them will need to find several thousand samples per year in order to achieve the optimal per-genome cost. I don’t know too much about the details of consenting samples, but I know that many, many research samples are not consented for whole genome sequencing. 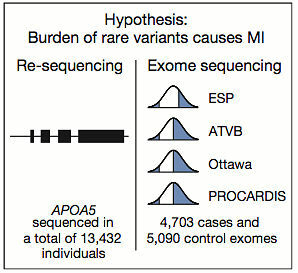 Because whole-genome has everything: your Y-haplogroup (for males), your APOE allele, your BRCA1/2 risk variants, etc. There’s no “we will only look at this gene or region” nonsense. Who is going to pay for sequencing all of these samples? Don’t count on the X Ten centers to do it; remember, they had to shell out $10 million just to buy the thing. Even at a reagents/personnel cost of $1,000 per genome, an X Ten running at full capacity will cost $18 million per year. That’s a lot of cash, in an era when research budgets seem to be flat (if not shrinking). So now you need samples and the funds to sequence them. It may actually be more difficult to persuade researchers to make the switch to sequencing, because it will still be five times more expensive than running a SNP array. I know that this post has had a bit of a negative tone, but I felt it necessary to get people thinking about the challenges ahead. Now, perhaps, we should talk about the promise of large-scale whole genome sequencing. At last, we’ll have sequencing studies that aren’t biased towards coding regions or certain genes. 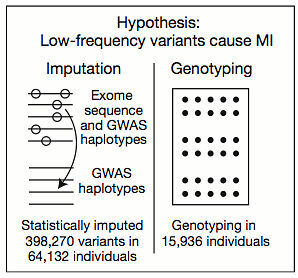 Every sequenced genome will harbor over 3 million sequence variants. We can go after non-SNP variation, too: indels and structural variants are far easier to detect by WGS, though SV calling is still a nascent area of bioinformatics. The wonderful thing about WGS is that it both enables and forces us to look beyond the obvious (e.g. the nonsynonymous variants in known protein-coding genes). We’re headed into the unknown, the dark matter of the genome, whether we like it or not. And that is a good thing. The last time I checked, the database of human genetic variation (dbSNP) contained over 50 million unique sequence variants. And yet, as anyone who analyzes exome or whole-genome sequencing data can tell you, every individual harbors a significant number of variants (usually around 5% of single nucleotide variants, or SNVs) that dbSNP has never seen. These “private” or rare variants undoubtedly contribute to important phenotypes, such as disease susceptibility. Non-SNV variants, like indels and structural variants, are also under-represented in public databases. The only way to fully elucidate the genetic basis of a trait is to consider all of these types of variants, and the only way to find them is by large-scale sequencing. In this month’s issue of Nature Genetics, the Genome of the Netherlands (GoNL) Consortium reports the whole-genome sequencing of 250 Dutch families from 5 biobanks across the Netherlands. The families comprised mostly parent-child trios (n=231), along with some family quartets with monozygotic (n=11) or dizygotic (n=8) twins. All told, it was 769 individuals whose genomes were sequenced ~13x depth. Half of the 20.4 million SNVs discovered in this study were rare, with MAF < 0.5%. The others were not quite evenly divided between low-frequency SNVs (4.0 million with MAF 0.5-5%) and common SNVs (6.2 million with MAF >5%). Altogether, there were around 7.6 million SNVs that were novel to dbSNP 137. Most of those 75%) were singletons, meaning that they were observed in just one individual. 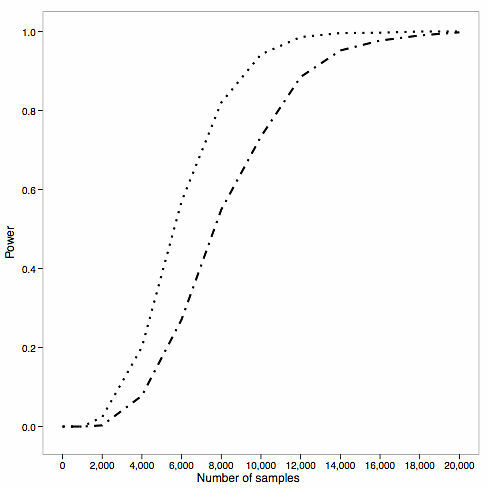 If we consider only the 500 unrelated individuals sequenced (the parents), that’s about 15,200 novel contributed variants per sequenced genome. Among the ~2 million singletons uncovered in the European panel of a different project (1,000 Genomes), 16.5% were observed in GoNL. The authors therefore expect that a “substantial number” of singleton variants reported by these projects will be seen again as larger European cohorts are sequenced. Even so, that’s a lot of “private” variation. Remember, too, that these cohorts are from northwest Europe, arguably one of the best-characterized ancestry groups thus far. De novo assembly of SV breakpoints. Some of the tools use one approach, while others employ multiple approaches. No single indel/SV caller has emerged as vastly superior to all others, so combining the results from a suite of different tools seems like a good strategy. The authors divided variants into three size categories (1-20 bp, 20-100 bp, and >100 bp) and kept any SV detected by at least two orthogonal tools. Their validation rate (138/144, or 96.5%) for randomly-chosen SVs of at least 20 bp is impressive. The size distribution of consensus calls showed peaks at +/- 4 bp (microsatellite instability), ~300 bp (SINEs), and ~6 kbp (LINEs). 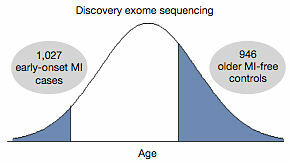 Not remarked upon in the manuscript is the largest peak right near zero, since 1-2 bp indels are by far the most common. While 54.4% of short indels (<20 bp) were already in dbSNP, virtually all of the mid-size deletions (30-500 bp) were not (98.4%). 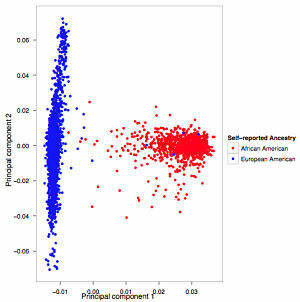 Thus, this study helps fill an important gap in the catalogue of human sequence variation. Because these families were not obtained “on the basis of phenotype or disease,” their patterns of genetic variation provide a useful model for apparently healthy individuals. Among rare variants identified in this study, the authors observed an excess of nonsense SNVs and frameshift indels, consistent with the expectation that damaging variants would be under strong purifying selection. A similar excess-of-rare-events was evident for larger deletions that removed the first exon or >50% of the coding sequence of a gene. The effect was even stronger when considering only genes in the OMIM database, reflecting strong purifying selection against structural changes in key genes. On average, each individual in GoNL had about 60 nonsense or splice-site SNVs. Most of these, however, were common in the cohort (MAF>5%, and thus unlikely to be deleterious), which illustrates the need for cautious interpretation of apparent loss-of-function (LOF) variants. Looking at rare variants, and using synonymous SNVs as a baseline, the authors estimate that each individual might have 4-5 rare loss-of-function SNVs. Individuals that were compound-heterozygous (i.e. one variant on each parental haplotype) for rare loss-of-function SNVs/indels/SVs were extremely rare. The authors found just 3 such instances across the cohort (an average of 0.01 events per individual). Such events are thus of considerable interest for disease studies. 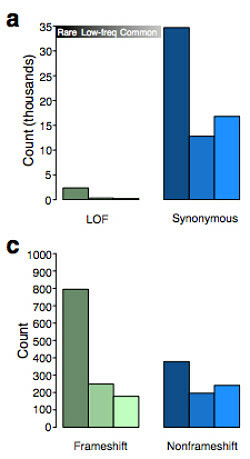 Compound heterozygosity for common LOF variants should have been far more prevalent, because these are less likely to be truly deleterious. Indeed it was; there were about 3 compound heterozygous events of common LOF variants per individual. Interestingly, the 1,917 such events observed across the entire cohort were confined to 11 genes (C11orf40, DEFB126, GSTT2, HTR3D, KRTAP4-8, MS4A14, OR13C2, SIGLEC12, TRY6, VWDE, and WNK1) which all seem to have high mutation tolerance. The human gene mutation database (HGMD) is a commercial repository of “disease causing” variation in humans. When the authors of this study annotated variants with HGMD information, each individual harbored about 20 such variants. In other words, HGMD annotation would suggest that a large number of GoNL individuals have diseases with profound physical (or even lethal) consequences. Whoops. 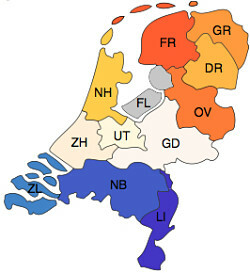 It’s possible that the HGMD variants simply cause disease in non-Dutch populations, or have low penetrance. An alternative possibility is that HGMD has a lot of false positives. Among the 1,093 HGMD variants in GoNL, almost a third had MAF>1%, which is much higher than the frequency of the diseases they’re reported to cause. One of the most fascinating aspects of this study was the exploration of de novo mutations (variants present in a child but absent from both parents). These events are extremely rare (occurring at a rate of around 1 in 100 million bases), and identifying them absolutely requires sequencing at least three genomes: an individual and both biological parents. Even then, they’re very difficult to find: Across the 258 independent offspring in GoNL there were 4.5 million apparent Mendelian violations. The authors applied a method (PhaseByTransmission) to refine this to around 29,162 candidate autosomal de novo mutations. That’s about 63 per offspring, far too many. So the authors attempted to independently validate over 1,000 candidate de novo mutations by orthogonal sequencing, and found that around 50% were false positives. Some independent Complete Genomics data for 19 parents and 1 child revealed another 1,137 events that were false positives. 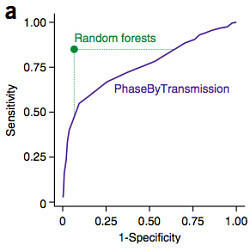 From these 2,270 observations, the authors developed a random forest classifier to predict whether a predicted mutation would be truly de novo or not based on a number of different properties. This is something that many other groups (including ours) have done for somatic mutation calling in cancer genomes. The classifier in this study, which had an estimated accuracy of 92%, relied primarily on factors related to the sequencing depth and read counts, which happens to be the basis for mutation detection with VarScan 2. When applied to the GoNL dataset, the classifier nominated 11,020 high confidence de novo mutations — roughly 42.7 per offspring — with a range of 18 to 74 per offspring. That’s still a bit higher than it should be, but still reasonable for downstream analysis. 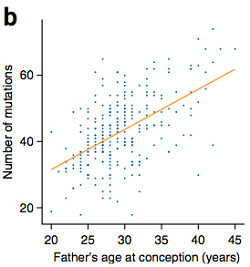 The authors observed a significant correlation between the father’s age at conception and the number of de novo mutations in the child. This is the third study to report such a trend, and the largest sample size yet. Although the ages of mother and father are highly correlated, its effect on de novo mutation rate was primarily due to paternal influence. The authors estimate that each additional year of paternal age caused a 2.5% increase in the number of de novo mutations in the child. Under their model, about 75% of de novo mutations come from the father, and 25% from the mother. Phase analysis using read pairs (a complex process I won’t go into) revealed that 76% of de novo mutations were indeed on the paternal haplotype. So you can thank your dad for 3/4 of your de novo mutations. 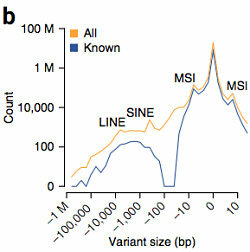 The authors attempted to find de novo indels and structural variants. It didn’t go well. The authors have employed moderate-coverage whole genome sequencing to build a resource of 1,000 haplotypes for a small, densely-populated country in northwestern Europe. 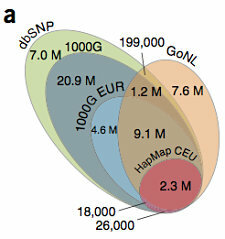 They added 7.6 million SNVs to dbSNP, and also characterized a large number of new indels and SVs. Many more studies which apply genome sequencing to large population cohorts will be necessary to fill out the catalogue of human genetic variation.